but the woman’s march wasn’t the only protest in Paris. 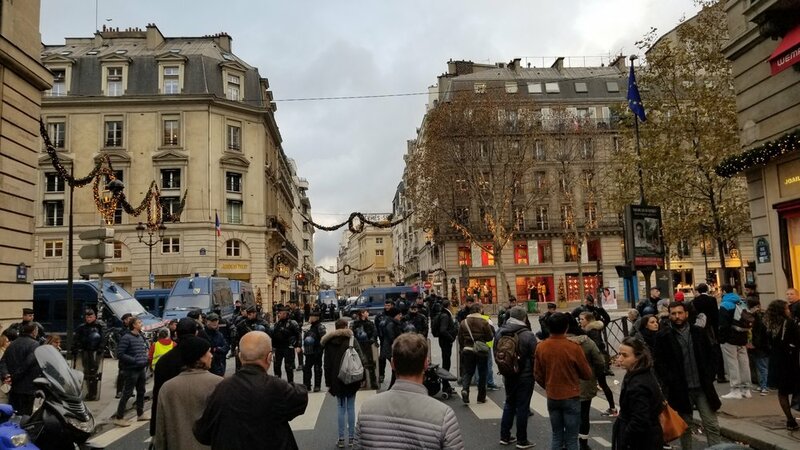 Conservatives were also protesting at the same time - against President Marcon’s gas taxes - and those protests turned out-of-control and violent: Fires were set, traffic lights pulled down, tear gas and water cannons used to break up the protests. This is the market in Old Marseille - down by the docks. you can buy pretty much any kind of seafood imaginable. 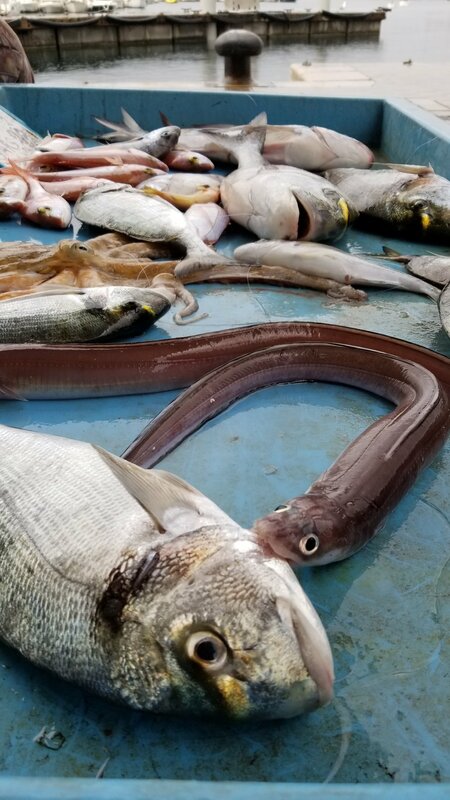 That’s an octopus, an eel, lots of other critters. Ok - check this out - the eel was still alive and started biting anything it could find. Glad they didn’t put me in there with it! more cheeses than I’ve ever seen - blue, red and multi-coloured! Elliot on the fly - need I say more? These are the ruins at the farthest-most tip of the Isle of Frioul. E-biking Marseilles on Thanksgiving Day!! Ok - these E-bikes are more fun than I thought. Did we every go a long way? We were cruising…made it to this awesome national park just south of the city. And look at those sunny skies! Mediterranean Islands everywhere. Sunshine an warm winds (look ma - no mitts!) What are those rocks made of? I don’t think it is limestone? Erin, you know? 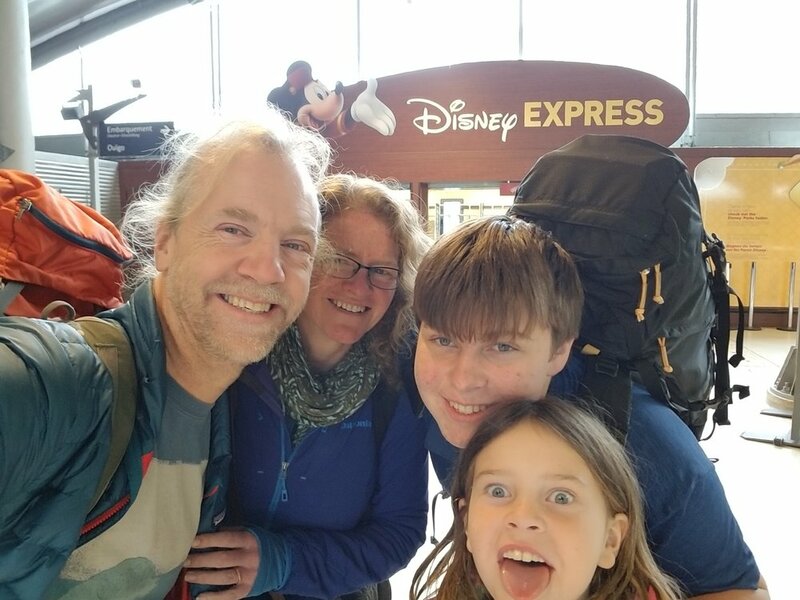 What a goophy family I’m traveling with. The stuff I put up with! It was Thanksgiving. Which meant we were inspired to stay in our loft apartment with the fabulous views and cook dinner ourselves. 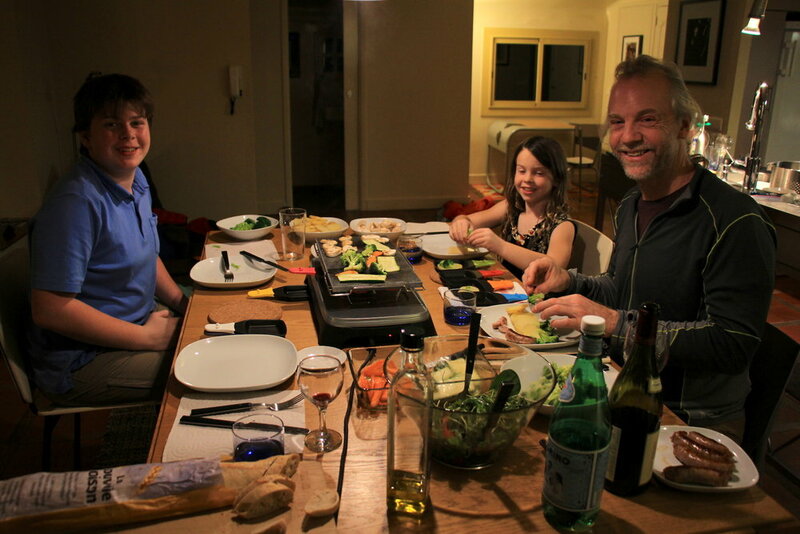 Raclette!! Yummy!! We’re headed off on a little boat. oh boy oh boy what fun! 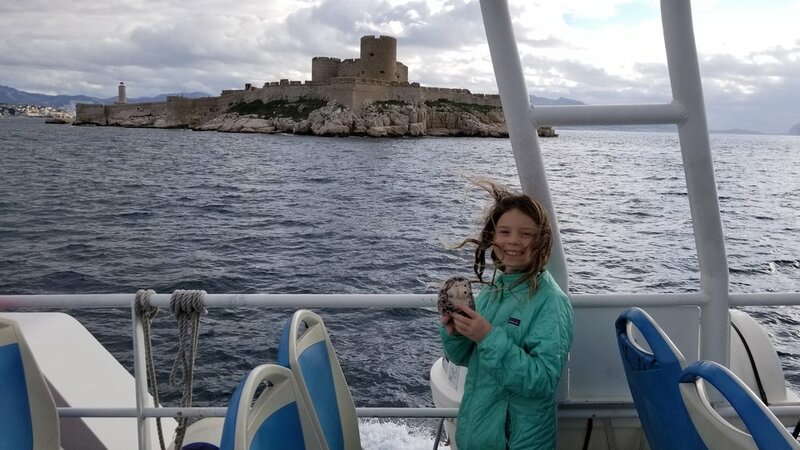 That’s an island prison we’re passing - Like Alkatraz in “Les Etas Unis” - but this one was also a castle - “Chateaux d’If” . All these crazy french names…. Elliot and Sophie being goophballs. I think this is a turret - do you know what that is for? They said Marseille (that’s on the Mediterranean) - but look where we ended up. What’s up with that - Dusneyland? Really guys? We’re in France. Look where we ended up - this is the view from our apartment. Marseilles is way way different from Paris. Le Tour Eiffel - SELFIE TIME (we weren’t the only ones…. How fun is this - they are giving away free plants, seeds and bulbs to anyone who stops by. This group “Vegetalisons Paris” wants everyone to have a few flowers and greenery in their lives. And games on the street too. We loved this one! There were ping-pong tables, folks playing with Jenga blocks. All sorts of fun. But boy oh boy it was cold - Sophie was wearing mittts. Glad I was wearing my furry coat! Paris loves to combine old with new and classic with funky. So I LOVED this building along the waterfront!!! My favorite building in Paris, easily. My favorite museum? PIcasso, of course. I felt at home with the characters in his paintings. It was Sophie’s favorite museum too. She spent the rest of the trip making picassoesque drawings! Le Louvre - one of the greatest museums in the world! (And they let me in - glad they didn’t put me into a glass cage like this woman). Actually, she’s an Egyptian “Mummy” - look at all the writing on her - I wonder what it says? These guys looked much more fun to hang out with!! But really, why do you go to the Louvre? To see the Mona Lisa, of course! So small… I was surprised at that. But the best part was that her eyes really did follow me around the room. How does she do that???? Like Santa Claus - who is visiting every house in the world on the same night, Mona Lisa looks at everyone in the room at the same time! Super cool to see a real artist at work inside the museum. The Eiffel Tower was awesome (but too much security). The Picasso museum was awesome. The Louvre was awesome. After three days exploring the streets and museum of Paris, we were tired, but full of inspiration. But it was getting cold. So we decided to head south, to the Mediterranean. I am off on another adventure: Paris, here I come!!!! And this time Sophie gets to go with me! and Dalmy… I’m not sure about having Dalmy on my head all the time, though. I love Sophie’s smile. We are going to Paris! Myself, Dalmy, Sophie (who speaks Spanish not French), Elliot (who speaks French, not Spanish), Dad (who speaks French, yay! ), and Erin (who speaks Spanish, like Sophie). Are you confused yet on who speaks what? I speak Hedgiese. It is a nine and a half hour flight from Seattle to Paris, France. But that wasn’t all… we left home at 5am in order to drive from Corvallis to Eugene and then fly from Eugene to Seattle. Then we had to wait for three hours in the Seattle airport. So I was exhausted even before getting on the plane to France. Greenland! All that ice, wow. Too bad dal was sound asleep…. Nine and a half hours. That’s a long time. I was very really hoping I would be able to sleep, but I didn’t get as much as I had hoped for. But we finally made it! The Notre Dame - it’s a very old church in the middle of Paris, on a small island in the middle of the Seine. We were staying at an apartment on the next island over - ‘Isle St. Louis’ - so we walked past here on the way from the train station to our new home. What a long day!